Brest really is a town defined by the sea. Situated in the north-west of Finistère, on the westernmost tip of Brittany, Brest's past, present and future are all bound up with the sea. The town was almost totally destroyed during the Allied bombing raids of World War Two, because the Germans had built a huge and important submarine base in the harbour, and this was the target of the raids. The town had to be rebuilt in the 1950s, and sadly lost many of its lovely characterful buildings and historical monuments. It remains, however, steadfastly Breton and French in spirit and style, with a thriving social and cultural scene and a modern outlook on life. It is also situated in a stunning part of the world, with cliffs, beaches and windswept moors to explore. Brest is known for its lively atmosphere, and it is a great place to visit once you accept that its glory doesn't lie in its architecture, much of which is uninspiring having been speedily constructed to replace the dereliction of war. The town has a proliferation of lively and welcoming cafés, bars, and restaurants where you can while away the time and enjoy some of the freshest and tastiest seafood in France. Other gastronomic delights are crêpes, stuffed with sweet or savoury fillings... or plain, and simply delicious. Wash them down with a little strong Breton cider, sit back and relax. Brest is stuffed to bursting with interesting and useful shops. You can buy almost anything you will ever need here, but if you are shopping for pleasure then do make the effort to find the Rue de Siam (named after the famous King of Siam), where there are numerous fascinating and attractive little shops awaiting you. Needless to say, Brest has a full complement of services and amenities, like any other sizeable city. There is a university here, a great choice of schools and vocational lycées, and also a naval academy. There are a wealth of cultural and educational opportunities on offer, with museums, theatres, cinemas and festivals. There is also a fantastic Aquarium called Oceanopolis, where you can not only see fish in their natural environment but also learn about the exciting research being done here. Brest has a very important port, and this is because it is one of the most accessible in France from the United States of America. If, like all the nice girls, you love the sailors, you will see plenty of them around town in their French fancy uniforms, and they add much local colour to the city streets! The town is home to the French Atlantic Navy, and this presence in the town gives it an added sense of purpose and importance. The port lies in a naturally protected harbour known as the Rade. If the architecture of the town leaves a little to be desired, the scenery around Brest most emphatically does not. From the dramatic granite cliffs and beautiful sandy beaches of the coast, to the high windswept moors behind, this is a landscape to fall in love with. Walkers will delight in the coastal walks, and horse riders too can gallop to their hearts content in the wide open spaces of the moors or the beaches. The sea also has its opportunities to try new and exciting activities, so have a go at windsurfing, sailing, surfing or just swimming. Budget airlines Ryanair and flybe have made it really easy to get to Brest, as they run direct flights in from the UK airports of London Luton (Ryanair), and Birmingham, Exeter, Manchester and Southampton (flybe). The Breton ferry ports are also easily accessible, so take a Brittany Ferry and sail to St Malo or Roscoff. House prices in Brittany are on the rise and have been for some time, as this lovely region is very popular, particularly with British people as it so accessible from the UK. The department of Finistère, however, still represents great value for money in comparison with the British property scene, and there are some lovely bargain properties available close to Brest. Renovation properties are still available here, and you can find almost any type of property ranging from old country projects at very low prices through to new villas and smart city apartments. Do you know Brest better than we do? Do you have photos of Brest? Brest is located in north-west France, on the south coast of the north-western tip of Brittany, in the Finistère department. Access: By air: Fly into Brest with flybe or Ryanair. By boat: The ferry ports of Roscoff and St Malo are the nearest, and these are served by Brittany ferries. Economy: The economy is strongly based on the sea... with the ports, naval activity, shipbuilding and fishing important. 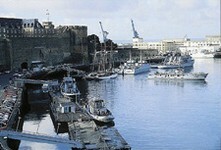 Interesting fact: Brest is the second biggest town in Brittany.